It’s common knowledge that low-end models provide the largest amounts of sales. But they are not profitable to a manufacturer. So, many manufacturers decided to create entry-level handsets on the base of more expensive phones, just cutting some of their features. 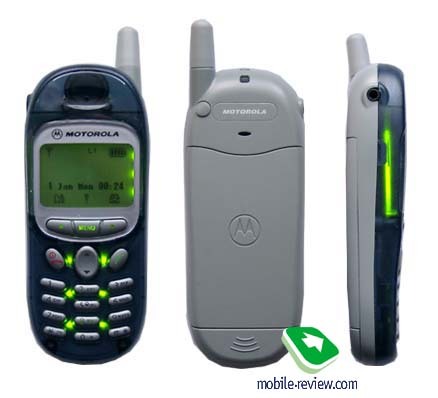 In case of Motorola T190, as a based model served a very popular Motorola T191. It has a rival price, but there were opportunities to simple the model. For example, there is no wap-browser in T190. To make a different design, engineers housed T190 in a translucent plastic exterior. Menu structure remains the same compared with the initial phone. If you are interested in details you can read Motorola T191 reiew, where you can find all information. Here we can demonstrate only several photos. Also we’d like to add that, though the phone weighs only 99 grams, it is rather heavy. Ni-Mh battery of 550 mAh capacity provides 3 days of operating time (in case of 3-4 calls 2-3 minutes each). The phone costs about 70 USD and it can be sold in those regions, where only one main function is necessary, namely connection. Such small review will appear more often, because manufacturers try to cut their prime cost to elaborate entry-level phones. Really even large amounts of sales can’t be profitable, if to put up money in such developments. Customers have several advantages, because new phones are based on approved debugged models and don’t have problems with software.